While the first part of Mrs. Nixon’s hope may not have been realized, many people in the San Diego-Tijuana region are working hard to guarantee that the second part – friendship between the two nations – endures. Numerous nonprofits, foundations, philanthropists, and businesses are working in tandem with government agencies in both the U.S. and Mexico to build neighborly relationships that unite San Diego and Tijuana as a “mega-region.” After all, the environmental health factors and socio-political and cultural movements of the mega-region can have significant impacts on people living on both sides of the border; the policies and practices on one side inevitably affect the health and wellbeing of the other. To take a closer look at these earnest efforts, Jewish Community Foundation of San Diego, International Community Foundation, San Diego Grantmakers (SDG), and U.S.-Mexico Border Philanthropy Partnership hosted a full-day learning tour of cross-border issues in Tijuana on August 9 for their collective members and donors. SDG’s tour featured an array of expert speakers along the way who discussed how innovative partnerships are positively influencing the U.S.-Mexico relationship and where additional needs remain. Photo courtesy of San Diego Grantmakers. 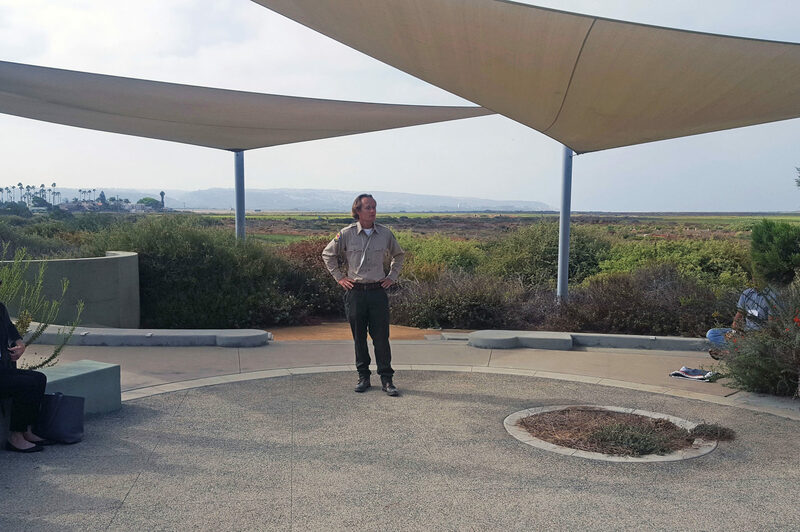 The tour kicked off at the Tijuana River National Estuarine Research Reserve Visitor’s Center in Imperial Beach. Among other things, the Reserve manages the Tijuana River Watershed – over 1,750 square miles of crucial drainage basins, 25 percent of which is located in the U.S. and 75 percent in Mexico. Imperial Beach Mayor Serge Dedina cited the watershed as a strong example of how the U.S. and Mexico work together as neighbors to preserve environmental, social, and cultural conditions on both sides of the border. This amicable sentiment continued throughout the day, framing the San Diego-Tijuana mega-region as a united front, regardless of its physical barriers. Michael Krichman, executive director of inSite, shared the history, through photographs, of how the arts community in both San Diego and Mexico have played a role in the socio-political relations of the border region. Daniel Watman, bi-national coordinator of Friendship Park and a volunteer leader with Border Encuentro, discussed those organizations’ efforts to create more public access to Friendship Park, host friendship events through the fence, and maintain a community garden spanning both sides of the border that provides food for the homeless and hungry. Finally, Margarita Diaz, executive director of Proyecto Fronterizo para Educación Ambiental, educated us about the entire Tijuana River Watershed, how the U.S. and Mexican governments could partner on treating and using the river water, and her organization’s efforts to create awareness and advocate about water pollution and environmental protection. 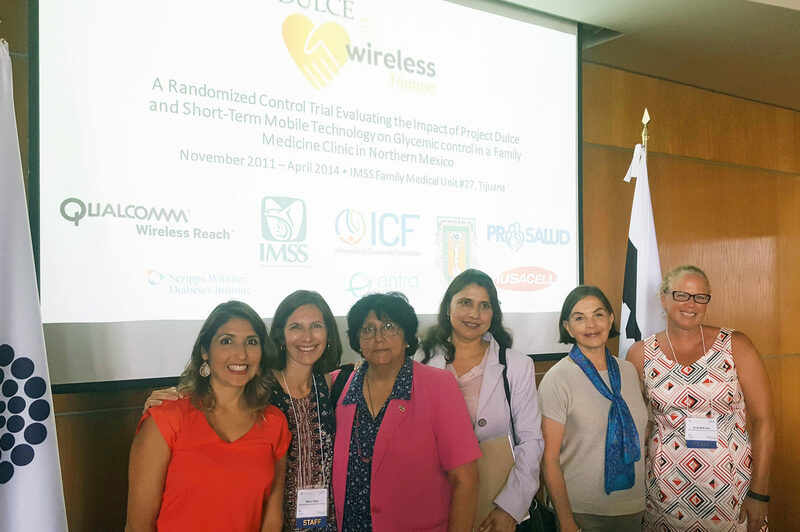 After lunch, a panel of health experts provided an overview of the groundbreaking Dulce Wireless Tijuana, a binational research study of a model which helped Mexican diabetes patients in Tijuana to monitor and control their disease using clinical care, education, and technology. Binational and multisector partners conducted the study with funding from Qualcomm Wireless Reach™; a key component of this model was development of the technology that allowed users to easily connect directly with their doctors and community health volunteers. The multisector partners are currently working on expanding this technology to a broader population of diabetes patients. 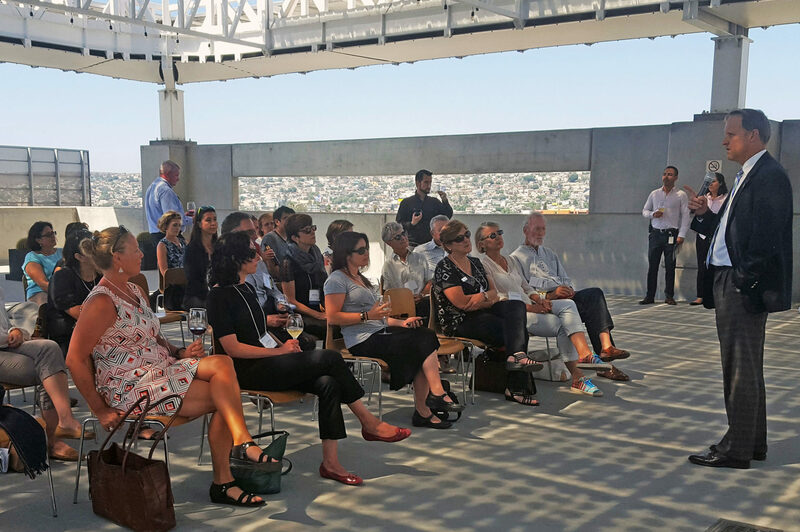 The tour concluded with rooftop refreshments from Javier Placencia’s lauded Mision 19 restaurant at the Gold LEED Certified building – and ninth tallest in Tijuana – Via Corporativo. And speaking of benefits, it’s also crucial to point out that Mexico has a burgeoning philanthropic sector of its own. Andy Carey, executive director of the U.S.-Mexico Border Philanthropy Partnership, explained how people generally think philanthropy in Mexico comes from outside the nation, but that’s not true. One thing is clear: the strong cross-border partnerships we forge today ensure that our vibrant mega-region continues to flourish – as business partners, friends, and neighbors.